Sinkholes cause multiple road closures in Md. Officials in two counties are asking commuters in the area to use caution and follow detours. WASHINGTON — Sinkholes in Maryland are causing road closures in Anne Arundel and Prince George’s counties. 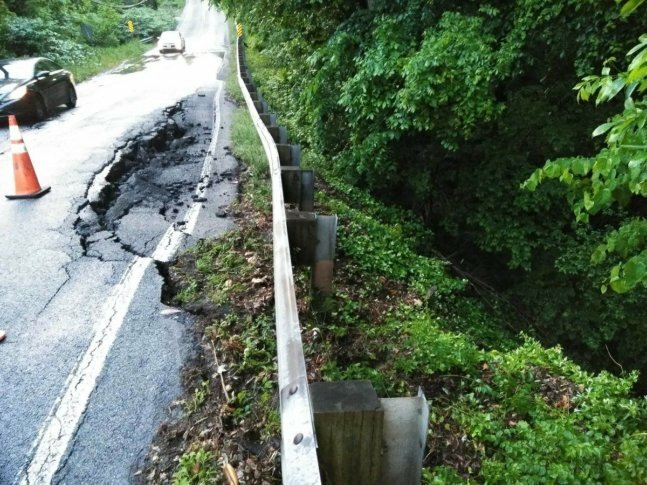 In Prince George’s County, Livingston Road near Clarion Road in Ft. Washington closed Wednesday morning due to the pavement caving in following heavy rains. County officials are asking commuters in the area to use caution and follow detours. In Anne Arundel County, crews are working to repair a sinkhole along Maryland Route 450. Be alert. Sinkhole closes 450 between A & Eagle Blvd and Windmere Ct.
State highway administration closed Maryland 450 between A and Eagle Boulevard and Windmere Court Tuesday morning. The road will remain closed until pipes can be excavated and replaced. It could take up to two weeks for the road to be repaired. In Frederick County on Wednesday, crews were cleaning up flood damage at Route 80 Just North of Route 17.